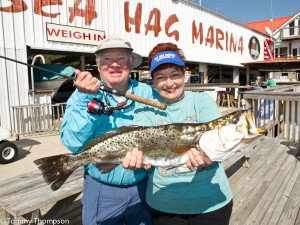 There’s just one more month to enter and win the Sea Hag Marina’s February/March Trout Madness Contest! Just catch a big trout, have it weighed and photographed back at the marina by an employee, and be eligible to win a $100 Sea Hag Gift Certificate. There’s no entry fee, and you can enter once a day. ALL entries are eligible for a random prize drawing at the end of the contest. JIm and Pat Wilson, from Panama City, FL with Pat’s winning trout, caught on the last day of the tournament in 2010!